Kevin McStay has accepted a proposed three-month suspension handed down to him by the Central Competition Controls Committee after an incident involving linesman Niall Cullen at half-time in Saturday's All-Ireland quarter-final against Donegal. 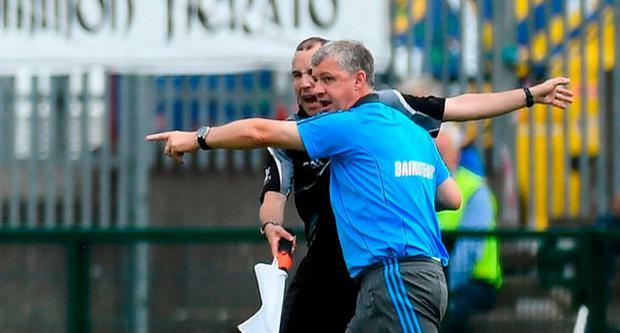 The Roscommon manager has wasted no time in accepting the charge of minor physical interference as he protested against the failure of the linesman to advise referee Ciaran Branagan of a clear free to Diarmuid Murtagh at the end of the first half. Roscommon lost the game by 0-20 to 0-13 and were 0-10 to 0-5 behind at the break. McStay felt Cullen had a clear view of the tackle on Murtagh while Branagan didn't and his ire was heightened by the awarding of a free out for Donegal. In his post-match interview, McStay pointed to an earlier free that wasn't given to his team when Michael Murphy led with his arm to push an opponent out of the way and score. Technically it's a free, but the practice of giving them for such actions is rare. McStay then threw the match ball in the direction of the linesman from a distance, connecting with him but subsequently apologised in the referees' room at half-time. The suspension will preclude McStay from being involved in Roscommon's final match of the All-Ireland series against Dublin in Croke Park on Sunday week.